The series consists of three levels - Beginner, Intermediate, and Advanced. The program is designed for professional adult learners who want to connect with Spanish-speakers in their lives, in the US and abroad. The books are graphically rich, streamlined, and non-intimidating. Check out the format in the sample pages above, including fun dialogs, funny excerpts, and engaging photos. The approach is organized and empowering - at the end of each chapter and level, you'll check off the things you've learned to do in Spanish - introduce yourself, order a meal, tell a story, make future plans, and much more! The accompanying free audio downloads and/or inexpensive CDs provide an essential pronunciation component, and are great for reviewing in your car or home. 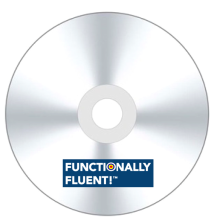 Functionally Fluent! is different - we guarantee we will make you "functionally fluent! - or your money back! Even outside of a class environment, our program has built-in components that make it easy for you to practice speaking Spanish in real-life. You won't just listen and repeat into a microphone - you'll be guided through truly interactive exercises to help you engage with real people!